At our crazy medieval theme wedding Lori Hawkrigg was the glue that held everything together, she was a light in the chaos and confusion. Lori made our wedding everything we wanted it to be, she helped us write our custom ceremony and walked us through it all step by step. Hi Lori Hawkrigg. Thank you so much! We had a wonderful wedding day. We are ever so gracious that you were a part if our special day." Thank you! Lori Hawkrigg we are so happy that you were part of our day. You were very professional and helpful and we are very pleased with the the service you provided and we thank you so much for everything! Thanks for being a part of our special day!! 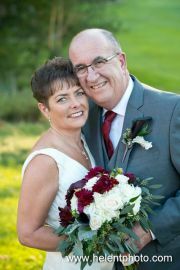 Lori Hawkrigg was able to quickly identify the kind of wedding ceremony that we were interested in, was easily able to guide us in the right direction with our vows, and provided invaluable and timely feedback. She ensured that our wedding day went extremely smooth. Thank you Lori! Lori Hawkrigg was brilliant, kind, professional and sensitive to our needs. Our day was better because of her. She was absolutely wonderful, kind and personable. She was very open to helping us customise our ceremony, and her confidence and professionalism allowed me to relax and know I didn’t need to worry. Her delivery during the ceremony was commented on by our guests – it seemed like she knew us well, and added humour. Everyone enjoyed our ceremony, and we couldn’t have done it without Lori and All Seasons Weddings. From start to finish they have been there for us, answering all our questions, and making sure we were at ease with our day and the process before and after the wedding day. She was prompt with her communication by email, and she worked well with the staff at Windermere Manor. We recommend her very highly. Lori Annne Hawkrigg was a wonderful addition to our wedding day. She helped answer many questions we had and insured the ceremony portion of the day went smooth and seamless. She was always happy to help with any questions we had about the ceremony or the official legal paperwork worked and we could not have asked for anything more from her. Thank you Lori and All Seasons Weddings for making our special day that much better. Everything was perfect and we could not have asked for anything more from you. Thanks so much for being part of our special day. We were so happy with the attention to detail that you gave and how you were able to customize the ceremony just for us. You were so organized and prepared, which allowed us to relax and enjoy the moment. 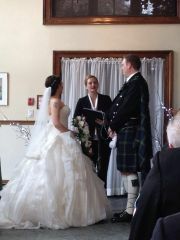 I couldn't imagine a better officiant! Lori was wonderful! She eased all of our nerves by having everything organized, and checked in with us multiple times. Lori Hawkrigg could not have given us a more personal and beautiful ceremony. She took time to get to know Brian and me, and tailored the entire ceremony around us. It was just beautiful! We had more family and friends also comment on what a lovely job Lori did. Lori's calmness, care and sincerity helped to make our day perfect. Thank you so very much, Lori. Lori was both professional and warm and a wonderful help to us in planning the perfect ceremony. The ceremony was the most important and most special part of our day, due in part to Lori's presence and help. She provided us excellent samples of readings and helped to guide us throughout the process of creating a unique and personal ceremony. On the day of, she performed the ceremony with grace, articulating herself well, with a good rhythm for the guests, and while maintaining a calm presence. Lori Hawkrigg helped us plan and tailor our ceremony to fit both of our personalities perfectly. She was professional, calm and supportive throughout the whole process. Lori was so kind and caring on our wedding day and made everyone feel at ease. All of our guest commented on how beautiful the ceremony was and how it really reflected who we are. Thank you so much Lori for making our day so special, it could not have been any better! 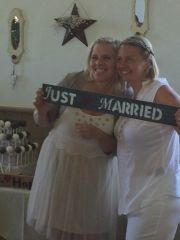 Upon meeting Lori Hawkingg My fiance and I felt chaotic with the whole ordeal of a ceremony, had no Idea what to expect. Once meeting her it was instant relief, she was so organized and made us feel so comfortable with how we wanted our ceremony to play out. The day of the wedding she made us both feel less nervous, and that everything is going to be ok. Her wonderful words and presence at the wedding set our day off to be absolutely perfect. She was more than officiant, she made sure everyone was in their spots and the whole ceremony ran without a hitch! Completely impressed by her service. Couldn't thank her enough. Lori Anne Hawkrigg ment our expectations and than some. She did an amazing job could not have asked for anyone better she did an amazing job and i would definitely recommend Lori in a heartbeat she did great. Everyone at the ceremony thought she did a great and wonderful ceramony. 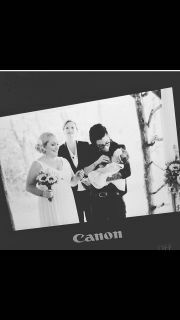 I have had a few girls I work with ask me about our officiant and I have told them she is a wonderful and caring person.I would recommend her to anyone. We would like to thank Lori and All Seasons for helping us with our amazing day and and extra thanks to Lori for doing an amazing ceremony! The ceremony was absolutely perfect! Lori made sure everything went off without a hitch and kept me calm and collected the whole time. I truly appreciate how prepared and professional she was, it made the day go smoothly and her words were perfectly suited for my husband and I. She spoke eloquently and the ceremony was graceful and special. Overall a perfect start to a perfect day! Lori was truly beyond our expectations. She helped us to be well prepared in advance. We loved her professional performance. Her calmness and helpful hints made us such a memorable wedding day. Indeed, we could not be happier with Lori’s performance. Dara and I were so incredibly happy with you! You were such a calming presence for us and truly, we both felt so comfortable and taken care of. You mentioned at our meeting before the wedding that the Bellamere is like a well-oiled machine, but I have to say, we felt that about you. You're organized and so on top of everything that we both felt like we didn't need to think of anything because you had it all taken care of. I can't tell you how wonderful that felt. On top of that, we just really adored you as a person and felt honoured to have you marry us and share in that joy with us. So thank you! We loved working with Lori on our ceremony. She was very professional and organized. But more importantly, she was very supportive and helpful in tailoring the ceremony to be just right for us. Her down-to-earth, non-judgmental, and kind nature made it a pleasure to work with her. We had a relatively small, family-only wedding and the ceremony was perfect for the occasion, adding the right level of solemnity and tradition. 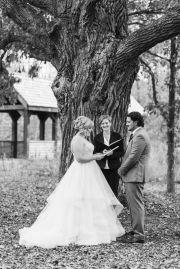 We would definitely recommend Lori as an officiant! We couldn't be happier with the professionalism, care and compassion Lori spent to ensure our day was magical. Lori took the time to personalize our ceremony and made sure we had exactly what we wanted! We still have people commenting on what a great ceremony Lori performed for us!! Thank you Lori for making our day all we dreamed of and more!! Thank you Lori for your time and commitment. We had so many people come to us and thank us for reminding them what true love was all about. They loved the words and the sentiment you brought forth. We are so incredibly grateful for all your suggestions and ultimately the ceremony of a life time. We can never thank you enough for making this day truly unique for us. Thank you again for all your hard work in creating a very personal and love filled ceremony. Lori Hawkrigg was a pleasure to work from start to finish. She was so accommodating and eager to work with us that we felt completely at ease and comfortable with her. The day of the wedding, her calming demeanour was a blessing when the weather started to turn before the ceremony. Her years of experience really shined through. We received much praise from friends and family that the words Lori spoke were so genuine and truly captured our relationship, history, and love. After the ceremony, guests came up to us and spoke highly of Lori's beautiful presentation that at times, some of our guests even joined hands when words of wisdom and love were wished upon us as we the couple held each other's hands. Lori absolutely wants your wedding ceremony to be an incarnation of the vision of your dream wedding. We couldn't have been any happier with Lori. Thank you so much! Lori was absolutely wonderful to work with. She guided us and helped us come up with a ceremony that represented us and our commitment. On the day of the wedding, she made sure everything went smoothly. All of our guests commented on how professional, warm and pleasant she was. I cannot imagine having anyone else officiate our wedding. I would not hesitate for a single second in recommending Lori!!! Thank you so very much for an absolutely perfect day!!!!! Lori was the perfect officiant for our day. Not only is she professional, but she is also a truly lovely person. 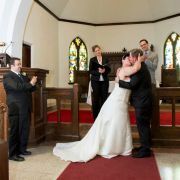 She understood exactly what we were looking for and performed a ceremony that both we and our friends enjoyed immensely. We could not imagine our day without her and cannot recommend her enough. 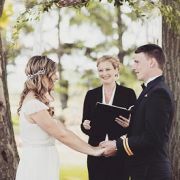 Lori was exactly what we were looking for in an officiant - she’s friendly, flexible, organized and professional. Lori helped us craft our perfect ceremony and then delivered it flawlessly. After the ceremony, a number of guests commented on how impressed they were with Lori’s performance and so were we! Thank you Lori! We just to say thank you for everything and for the lovely Ceremony. Thank you so much! We absolutely loved your delivery and couldn't have asked for a more perfect person to assist on our special day. We had numerous compliments on the ceremony and yourself. Everyone thought you complimented our day perfectly. We appreciate your professionalism, punctuality and help in making sure everything worked out as planned. 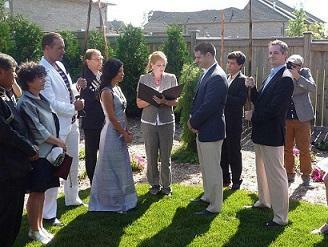 We would definitely recommend you to anyone who is searching for an officiant for their special day. I knew when I read your bio that you were the very best officiant we could have ever hoped for!! Not only were you so uber professional and organised, you made the ceremony so very beautiful.I think that you and Todd were the perfect team!! We cannot thank you enough! I know every bride and groom tells you how wonderful you are, but I tell everyone I could not have had a better officiant if I created her from the ground up myself!! Thank you again for giving us the most beautiful heartfelt ceremony ever!! Lori was an absolute pleasure to work with from start to finish. She is very well organized and provides you with all the information you need to know leading up to the big day. She helped us customize a wedding ceremony that was uniquely ours. We had guests coming up to us afterwards saying it was the best wedding ceremony they have ever been to! 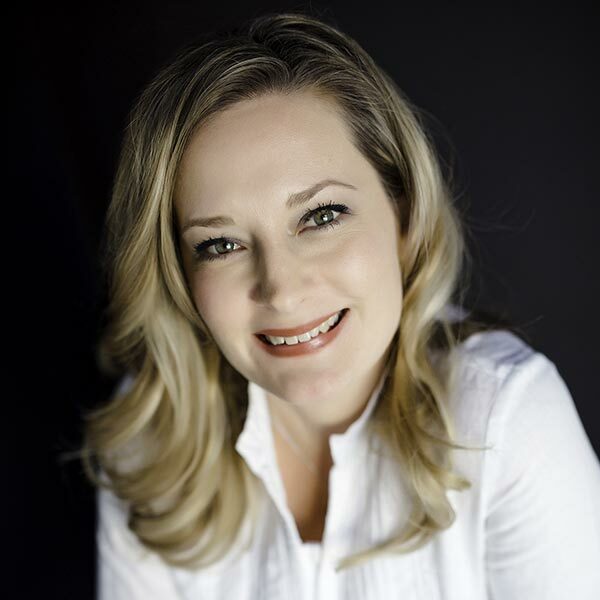 Thank you Lori for everything.... we would highly recommend you to anyone getting married! All the best to you! We hope to see you at more weddings in the future. Lori was outstanding. When we first met her we knew we had made the right choice, but she exceeded our expectations at the ceremony. She was polished, genuine, caring and made us and everyone in attendance comfortable. We would recommend her to anyone and everyone. Her professionalism and style added significantly to our day. 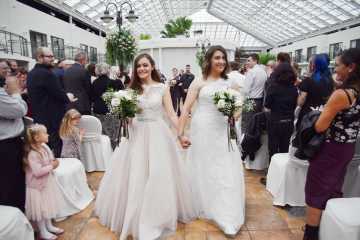 “We found Lori by chance - through All Seasons Weddings Ltd., based on the geographic location of our venue. As a “Type A” bride, having everything be just perfect for our big day was tremendously important to me and my fiancé and not knowing anything about Lori was initially concerning for us. We had our hearts set on wanting a personal and unique ceremony - and not the same vows we had heard numerous times at weddings before. From our first phone meeting, beyond being exceptionally lovely, warm, and kind - Lori was SO prepared and knowledgeable about every aspect of the formalities and the “official side” of marriage. It was clear this was going to work out very well. Throughout our planning process, Lori gave thoughtful suggestions for components of the intimate ceremony we wanted, listened to our ideas, concerns (and a ton of questions!) and overall, put us at ease. She was available at all times by phone and email to provide guidance, ideas and provide full clarity on what we needed to do every step of the way. She followed-up regularly, to ensure we knew everything required of us. She was the perfect officiant for our ceremony. The perfect officiant for us. She was totally prepared and polished, well-spoken and articulate. She took charge of our rehearsal and ceremony and our large wedding party and guests commented on her professionalism, poise and positivity. We found Lori quite by chance but feel immensely fortunate she played such an integral role in our wedding ceremony. We couldn’t be happier with her, and her services! Would wholeheartedly recommend her to anyone. Thanks Lori for making our special day very stress free- amazing ceremony and happy about your recommendation to bring our kids into the ceremony- they loved being part of it- all 5 of them! Dear Lori Thank you so much for all you did for us on Saturday. The ceremony was absolutely lovely, and Shirley and I were both thrilled with it. Many people commented that you did a wonderful job and that the content of the service was just perfect. Thank you so much for being a big part of our day. 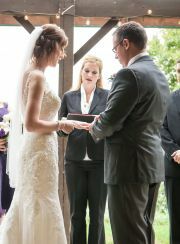 We are so thrilled we got to have you officiate our wedding. You are so kind, professional, and organized, and helped us navigate through all of the important steps. You helped us create a perfect ceremony that represented us, and performed it flawlessly on the day of (even outside in the pouring rain!). Thank you again! Brenda and I would like to express our heartfelt thanks to you for making our day perfect. From the very beginning of our conversations you answered all of our questions and developed a service that met our needs to the fullest. Our day would not have been as perfect as it was without all of your assistance and guidance. We and others especially liked the part where you talked about bringing our families together as one. Thank you for all your support. Dear Lori, We wanted to thank you so very much for helping to make our wedding day so very special! We can't thank you enough! Everything we had envisioned for our ceremony was accomplished with the guidance of you! THANK YOU. We also wanted to let you know that our guests were all very pleased and really really enjoyed the ceremony. They all commented on how lovely you had made the ceremony. We are very thankful we found you! Thank you again Lori for being with us for the moments that meant the world to us! Thank you again for everything. Even when the weather changed and things were moved at the last minute you kept your cool and had a plan ready to go. Everyone loved the ceremony and thought you did a great job. We even had a few of our engaged friends at the ceremony ask how to get in contact with you. You really made us feel like our day was special and that it mattered. We really can't say thank you enough! Thanks again for everything. Lori Anne Hawkrigg did a wonderful job helping us create a ceremony that felt right for us. She was easy to contact and had so many ideas for us to choose from! We appreciate all of the work she put in and received many compliments afterwards on a beautiful, well-spoken ceremony! Thank you so much for being a part of our wedding day! It was absolutely perfect!! Many of our guests commented on the beautiful ceremony! Your attention to detail truly put our minds at ease with the whole planning process. 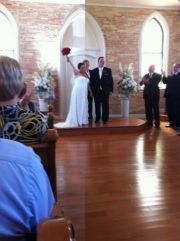 The day was everything we could have hoped for and more!! Lori Hawkrigg was an excellent officiant for our wedding. 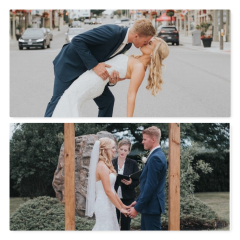 We got in touch with her many months in advance after a lengthy search and found that she was perfect for our ceremony. She is versatile and can provide a wide range of ceremonies depending on the tastes of the bride and groom. A month before the wedding, we scheduled a meeting with her to discuss details. By that time, we thought we had most of the planning done, but thanks to her vast experience, she brought up many logistical things we hadn't considered which helped us polish the ceremony even further. She diligently sent us a copy of the ceremony speech with several different variations for each portion which included poems, phrases, and multiple paragraphs per section from which we chose our favourites and customized what we wanted. She did some editing and finally sent us back a copy of the final draft with all the choices we had made it and looked great. The ceremony itself was beautifully spoken. She is a fantastic orator and our family was impressed with how she presented us as a married couple. Lori is a woman who comes prepared for all occasions and will make your wedding ceremony wonderful! I want to send you a huge thank you for making our day so special. It was obvious we were very nervous but because of your help we managed to hold it together. Thank you very much for he meaningful service and ceremony you prepared and delivered for us. We will always remember it.